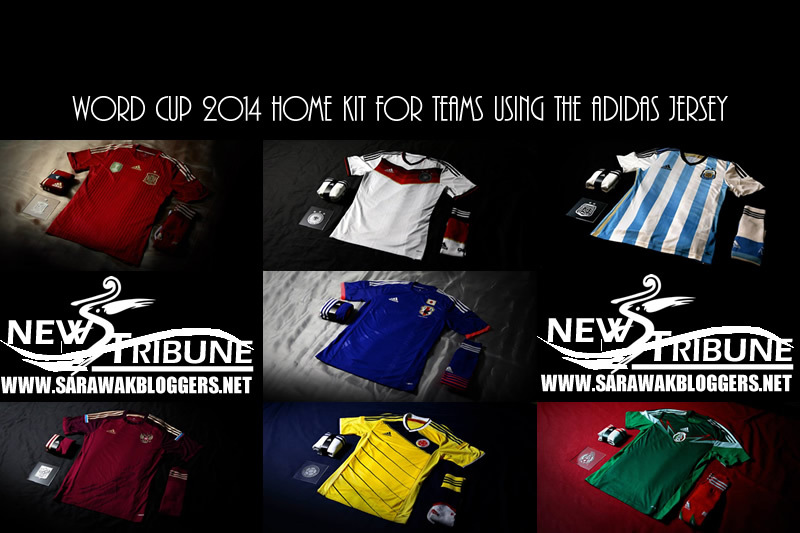 adidas recently launched the 2014 FIFA World Cup kits of seven leading national football federations, encouraging fans to “show your colours or fade away”. The kits of Argentina, Colombia, Germany, Japan, Mexico, Russia and Spain have been unveiled with technological advances, producing the lightest kits adidas has ever created. The players’ uniforms will also feature eye-catching designs, inspired by the next generation of football fans. The national kits have been created using adizero technology, producing lighter kits and an improved fit, enabling players to be faster and more comfortable on the pitch. The 2014 FIFA World Cup federation kits are over 40% lighter than equivalent 2012 kits, weighing in as the lightest kits ever produced by adidas. Due to technological advances weight has been removed from the main jersey, collars and sleeve cuffs, as well as the national federation crests and even the iconic adidas three stripes. The shorts are now also made with a new woven lightweight fabric for increased breathability and a lighter waistband. These innovations will give the world’s best players extra freedom of movement and comfort, while retaining resilience and durability on pitch in Brazil. his feedback gave strong feelings of national pride, history and hope, which were in turn translated into stunning kit designs, set to ignite the patriotism and passion of each country. The process was mirrored across each federation, creating seven individual stories and design themes; from the inspirational feats of Russian cosmonauts in the 1960s, to Mexican artistry and the independence of Argentina. All seven national federation kits were designed and extensively tested across an 18-month period. Professional players across Europe and Latin America tested the kits under match conditions and the pressures of a game situation to ensure durability, consistency and sustainability alongside elite performance and lightness. The unveiling marks the next phase of adidas’ “All in or Nothing” 2014 FIFA World Cup campaign following the launch of the Samba Collection, a Brazilian-themed football boot collection, in early November. The FIFA World Cup tournament is the world’s largest football event and the ultimate platform for the adidas state-of-the-art apparel, hardware and footwear.